For many, investing in 401k, IRA, or Roth, at times, is a risky proposition. However, none of us can deny the fact that these are the best places to keep funds for long-term goals - say for retirement. If you have already dedicated funds in any of these investment accounts, it’s your duty as an alert investor to stay on top of the changes that take place for these accounts every year. Keeping a tight vigil for the changes can help you save your retirement portfolios from the odds. First of all, the things that are going to remain the same. 1) Contribution limits: A ‘No Change’ is always relieving for many since it implies that everything is going to be the same. A no change in contribution limits means that you would be able to contribute the maximum amount you could in 2015. In 401k plans, the amount is going to remain $18,000 for people below 50 years, and in IRA and Roth, the maximum contribution is going to stay at $5,500 for the same age structure. Only about 10% of the account holders max out every year though none can deny the fact that the more you put away, the better off you’re going to be in the long run. 2) 401k or IRA combo: Many people live under the notion that you can have either a 401k or an IRA, but not both. This is just a myth. Most financial advisors hail keeping both 401k and IRA. However, the pitfall of keeping both portfolios running at the same time may drain your available liquid funds. Else, may force you to reduce your contributions on both portfolios. Nonetheless, in 2016, the income limitations are going to remain the same. If your adjusted gross income is between $61,000-$71,000 for single and head of household, or between $98,000–$118,000 for married couples, your deductible for contributions to your IRA will be phased out. However, if your income is lower, you’ll receive the full deduction you’re entitled to receive. While you won’t be able to deduct any portion of your contributions if your income is over those limits. Here are the stuff that are going to change. 3) Roth income threshold limits increase: Roth investment plans are very famous, especially among the millennials. Also called reverse IRA, here your contributions are made on an after-tax basis while your distributions in retirement are tax-free. Here you save money on taxes given the possibility that you will be in a higher tax bracket when you retire. In 2016, the contributions income threshold limits are going to increase by $1,000. 4) IRA for Non-Working Spouse: There are many spouses who don’t have a permanent job but still they want to contribute to an IRA. 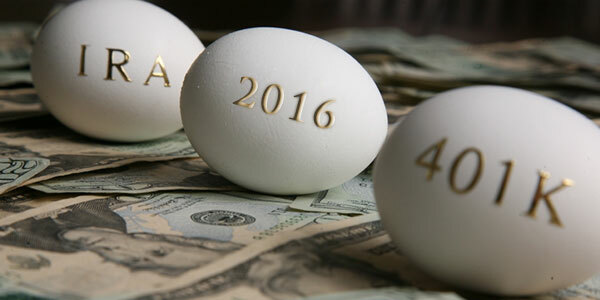 In 2016, IRA income limits for spouses without retirement accounts will increase by $1,000. If you contribute to a retirement account at work but your spouse doesn’t work, he or she can set up an IRA and if you file together, contributions will be tax deductible up to $184,000. Your contributions won’t be tax deductible above $194,000. You can certainly contribute up to the IRA contribution maximum, however, you won’t receive the deduction. 5) Saver’s credit: The saver’s credit is arguably one of the most overlooked tax credits. It will reward you if you fall in the lower income group but still save for your retirement in any retirement plan. If you qualify, it’s worth anything from 10% to 50% of the contributed amount - up to $2,000 for individuals and $4,000 for couples. The upper-income limit for singles is $30,750, and for couples, $61,500. Discuss with your financial advisor about the changes so that you can have the greatest benefits. What should you consider in bankruptcy to protect retirement income?